Royal West Indies Resort ( RWI ) Luxury, beachfront condo on Provo's Grace Bay Beach, rated #1 in the world by Conde Nast traveler magazine and Trip Advisor!! Our suite is located on the second floor in the only beachfront building in the resort. The balcony overlooks the fabulous, world renowned, Grace Bay Beach. This is as close as you can get to Grace Bay Beach in Provo! You need to see it to believe it!! Beautifully lush landscaped exterior and spacious interior. This is an elegantly upgraded, privately rented suites with all the amenities provided to help you enjoy this fabulous hideaway in the Caribbean. Royal West Indies Resort has become the place to stay on Grace Bay for Honeymooners, Golfers and Divers or travellers looking for the perfect hideaway. We are located in the resort’s first and only beachfront building on the second floor overlooking the pristine white sandy beach and turquoise water of Grace Bay Beach. Relax on the large balcony overlooking the beach, fall asleep to the sound of the ocean and wake up to see the ocean when you sit up in bed! This upgraded centre Studio Deluxe suite is perhaps the best Studio in the resort and is only available through the owners. Enjoy the comfort of knowing the suite you booked is the one you get...you only get this assurance through the owner. Be a privileged special guests of suite 123. The centre studio units are larger than the side studios as they do not have a lock off vestibule shared with the adjoining one bedroom suites which also makes them quieter and more private. Additionally, the centre studio’s beachfront view is unobstructed by the extended one bedroom on each end of the building. 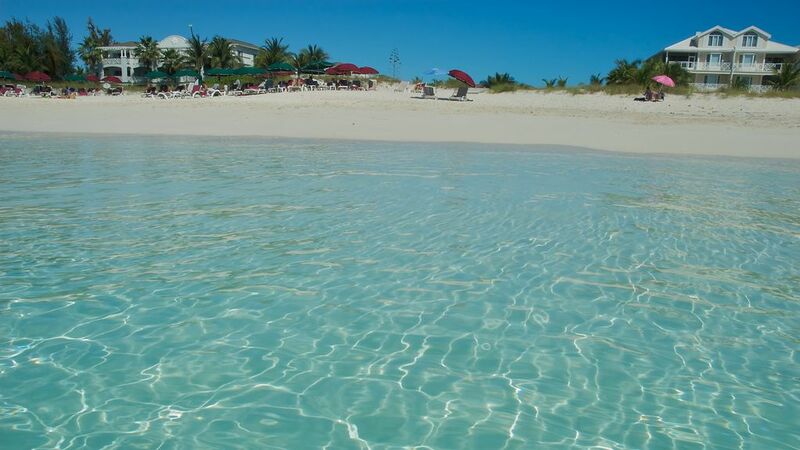 This stretch of Grace Bay Beach is where Jojo the dolphin hangs out. Come down to see Jojo, our local star featured in the IMAX movie available on DVD. Perfect for a honeymoon hideaway, golf and diving vacations, or just getting away to frolic in the ocean! All this and the best rates too. We look forward to hearing from you. Keywords: beachfront condo, ocean front, turks, royal west indies, beachfront, grace bay, providenciales, studio. You can not get any closer to the beach than this! 700 thread count crisp white cotton sheets ironed before each guest. Some detergent is available in the suite. Beach towels are available to our guests at the pool side or beach cabana. On site wifi is available, no extra charge. full size fridge with top freezer. Kitchenette with full size fridge w/ freezer, microwave, sink and everything you will need in the way of dishes, cups, glasses and utensils. Digital Music channels on TV...Select any type of music you like. Caribbean books and novels left in the suite by past renters..
We have provided a small collection of DVD's for your use. large balcony with chairs and lounger. Spectacular sunsets from the balcony overlooking the best beach in the world. 2 Hobby cats (14') catamarans available to guests on beach...or book a boat tour. Some tour operators will pick you up on the beach in front of the resort weather permitting. On site deck near the ocean for resort guests to sit outside next to the water. Top rated golf course is 2 min drive away. In-room safe, Large Private balcony overlooking Grace Bay beach. Balcony ceiling fan, On-site restaurant and bar, close to stores and restaurants.